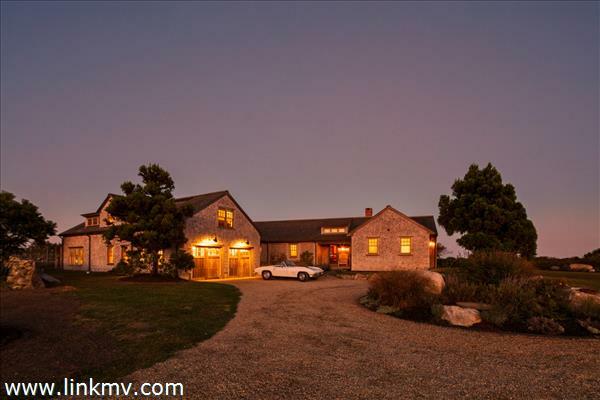 The best and most coveted location on Martha's Vineyard - Squibnocket Farm. Set within a private, gated +/- 500 acre community that includes over 300 acres of conservation land, extensive private waterfront on Squibnocket Pond, miles of sandy Atlantic beach with towering dunes, and only 12 homes, this turnkey offering melds modern construction and comfort with an idyllic farm-like setting. Stately and elegant, the property residence sprawls peacefully amid surrounding natural beauty. The home was designed and built by Soikkeli and Company, a well-known luxury contractor on the Island. The exterior design evokes traditional New England farmhouse style, with multiple gables and cedar shingles defining the facade. The living space centers on a gorgeous chef's kitchen - soapstone counters, custom farm sink, all new top of the line appliances and fixtures, and a charming pantry are just a few of the outstanding elements found within. Two living rooms flank the kitchen on either side, and the master suite is set perfectly on the first level at the home's southern end. Four additional bedrooms are found on a northerly wing, as is the two-car garage. Views of the ocean, Squibnocket Pond, Noman's Land, and open fields are readily available from many rooms. The house is wired for sound and includes smart home features such as Nest learning thermostats for the AC and heating systems, and sound controlled by HEOS and the Google assistant. The landscape of the property was thoughtfully designed, highlighting ancient stonewalls on the property borders. Along with gracious lawns, flower beds and an organic vegetable garden, the property offers nearly 3 acres of fenced pasture as well as permits for a pool and horse barn. Outdoor living areas to enjoy include an expansive back deck, a superb screened porch with outdoor fireplace, and an outdoor fire pit - ideal for summer evenings or nighttime star-gazing. Ownership in Squibnocket Farm provides access to miles of trails, multiple accesses to Squibnocket Pond, and access to the exquisite homeowners beach, which is home to some of the most stunning sandy beachfront and dunes on the Atlantic seaboard. Squibnocket Farm is a paradise that must been seen to fully experience - a rare enclave of privacy and calm. Very open main living space with defined central kitchen flanked on two sides by living rooms - one with wood burning fireplace and the other with space for dining and views of garden and stonewalls. One first floor master on one side of the house and second wing on other side. Two bedrooms sit half a story below the main floor at ground level (main floor is elevated slightly due to change in grade). Two bedrooms with excellent views, sharing a full bathroom.